‘Queen Victoria’ travels by Red Funnel Ferry to the Isle of Wight. With huge interest in Queen Victoria following the release of the new film starring Judi Dench and Ali Fazal, and the return of ‘Victoria’ to ITV, Red Funnel has produced a fun and engaging video to persuade busy Londoners to escape the city and head to the the Isle of Wight. 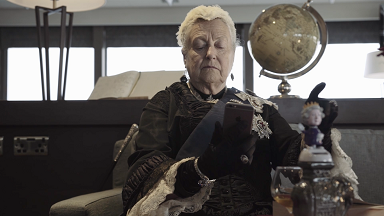 Working with partners South Western Railway and English Heritage, the short, tongue-in-cheek video features Queen Victoria set in the present day, escaping the monotony of life in London. It starts at London Waterloo with Victoria, or ‘Nan’ as she becomes known, talking via text message with her granddaughter. Victoria travels solo by train from Waterloo with South Western Railway and makes her way to Southampton Central before boarding a bus to the ferry terminal. In the video, Victoria cruises in opulent style across the Solent and is met on arrival in East Cowes by her horse-drawn carriage for the short ride up the hill to her beloved Osborne, the royal palace by the sea, designed by Prince Albert. This video has been released online to coincide with the launch of the new Victoria’s Island trail which highlights thirteen locations and attractions across the Isle of Wight which have a connection with Queen Victoria and her family. They include the newly reopened Farringford, the former home of Lord Tennyson; St Mildred’s Church; Carisbrooke Castle; Shanklin Chine and the unique Ventnor Botanic Gardens. The trail allows visitors to literally follow in the footsteps of the former Queen – to walk along the same paths, to see the same views and to enjoy a unique journey around the Island.